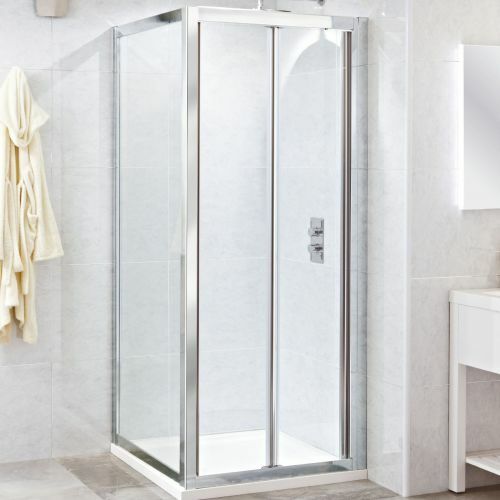 The Phoenix Spirit Concertina Style Shower Door is a highly versatile shower door that looks fantastic and will fit any bathroom. The bifold door opens inward and is made with precision to save space. The polished chrome finish gives the frame a nice finish and there are several door sizes to choose from, including 760mm, 800mm and 900mm. The door is reversible for either right hand or left hand entry and the height is 2000mm. The shower door is constructed from 5mm toughened glass and the optional side panel is thick 8mm toughened glass. Concealed fixings have been used to give this a minimalist look. If you want an elegant shower door suitable for 1, 2 or 3 wall installation then the Phoenix Spirit is perfect. Not only that, but it saves space and is made from quality toughened glass that will last for many years. You'll love how it looks from the moment it's installed.